New recycling bins popping up around communities is due to the increased focus on "going green" across America. The United States recycling statistics have vastly improved each year since the first United States recycling recovery center opened its doors in the 1890s. But, the nation still has a long way to go before it hits a perfect recycling stride. Something important to know when talking about recycling is Municipal Solid Waste (MSW), better known as trash. The United States Environmental Protection Agency (EPA) 2013 fact sheet takes into account the MSW statistics each year when computing national recycling figures. MSW (p. 4) includes common household throw-away items such as food scraps, package wrapping, grass clippings and even bigger items like an old microwave, sofa, or refrigerator. In relation to recycling statistics, MSW does not include items such as hazardous, industrial, or construction waste. The EPA fact sheet (p. 2 and 3) notes that along with sustained improvements in waste reduction, the overall bulk of the nation's MSW production has decreased between 2000 to 2013. The MSW production in 2013 was 254.1 million tons (p. 2). Disposal rates were down from 89% in 1980 to 53% in 2013 (p. 3). Composting and recycling are the two methods of material recovery. Compostable organic waste is the largest component of MSW, it makes up to one-third to half (p. 6) of the MSW according to the Institute for Local Self-Reliance (ILSR). In the ILSR survey of 33 of 50 states provided data on quantities of compost production amounting to 19.43 MT. Seventy percent of this was yard trimmings. Food scraps, biosolids, agricultural waste including manure were some of the other main items. The EPA fact sheet estimate for the whole nation is 22 MT (p. 4). The five largest recyclers of compostable waste in 2013 were California (5.9 MT), Florida (1.5 MT), Iowa (1.3 MT), Washington State (1.2 MT) and New York (1.0 MT). There were 4,914 composting operators in U.S., each with different capacities, and on an average they produced "only 5,155 tons/facility/year" which the ILSR finds is low. 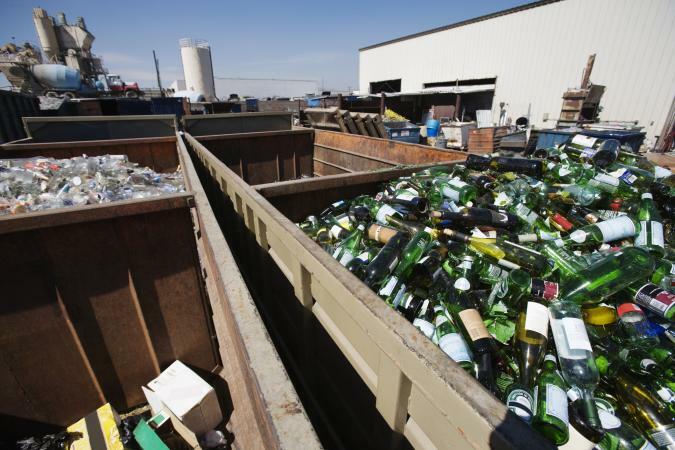 Recycling helped recovery of 64.7 MT of MSW as stated in the EPA fact sheet (p. 4). Besides recovery, 32.7 MT (or 13% of MSW) were combusted for energy according to EPA (p. 4). Recovery of waste by the type of waste is also tracked by various agencies. Not all of food waste is composted. There are many ways in which it is recycled according to a 2015 Post-Consumer Food EPA report. Donation by residents, and commercial units like restaurants, grocery stores to charities and local food banks account for 1.5% of food waste diverted from landfills through two agencies: Food Donation Connection and Feeding America (p. 4). About 0.74% (0.1 MT) of discarded food from restaurants, retailers, and residents was used as animal feed from 2011 to 2013. Biogas was produced by anaerobic digestion of solid waste by 1,500 digesters across the US. This included food alone or mixed with other MSW (p. 7-11). Food waste refers to post-consumer waste from restaurant, grocery, and household food, and excludes preconsumer food from food processing facilities, agricultural operations, or other industrial processes. Of the commercial units surveyed, a good portion still had most of their waste end up in landfills (p. 2). The manufacturing industry reported the highest recovery rates through animal feed at around 82%. The American Chemistry Council states that in 2014 that 6 billion pounds of plastic were recycled. This included "more than 3 billion pounds of bottles, nearly 1.3 billion pounds of other rigid plastics, and nearly 1.2 billion pounds of flexible wraps and bags also known as 'film'." The recycling rate of plastic bottles fell to 31.1% in 2015 from 31.7% in 2014. PET (1) recovery decreased by 15 million pounds. HDPE (2) recovery was 34.4% or 1.1 billion pounds. PP (5) recovery was 32 million pounds. On an average, Americans threw away 70 pounds of clothing, textiles, shoes or accessories. Eighty-five percent of this was destined for the landfill where it takes up 5% of the space according to the Council for Textile Recycling. Of the 23 MT of metals (EPA fact sheet p. 8), iron accounted for 17.55 MT (or 6.9% of total waste), aluminium 3.5 MT (or 1.4%) and other metals for two MT (or 0.8%). Iron accounts for 33%, aluminum for 20%, and other various metals 68.2% of the total recycled metals. Although electronics are recyclable, in 2013, only around 40% of selected e-waste was recovered according to EPA fact sheet (p. 9). Computers and other electronics discarded in landfill become a source of disproportionately large amounts of hazardous waste like lead, cadmium, mercury, and other materials. Batteries are not allowed to be dumped as many contain toxic metals like cadmium, mercury, lead or nickel. Ninety-nine percent of lead-acid batteries are recycled according to EPA fact sheet (p. 5). Dry cell batteries used in many electronics also have to be recycled through store or community recycling facilities. Hazardous waste and construction and debris waste are not included in MSW. Construction and debris (C&D) waste to the tune of 530 MT was produced in 2013 (EPA fact sheet p. 17). Ninety percent resulted from demolition. This contains bricks, tiles, cement, asphalt shingles and concrete, wood, and steel. Most come from bridges and roads and not from buildings according to the EPA fact sheet. There are 9,800 municipal recycling plans in the US, but they follow different rules points out The Economist in 2015. Only 2.3% (or 2.7 million) households in US were served by curbside food collection in 2013, according to the Post-Consumer EPA report (p. 16). In 2013, 3,560 community composting programs were present, and this was an increase from 3,227 in 2002, notes the EPA fact sheet (p. 12). How Does Your State Stack-Up? One of the best ways to improve United States recycling statistics is to start at the state level and filter down to the community level and home level. The more responsibility taken at lower levels in the recycling chain, the better the national outcome will be. 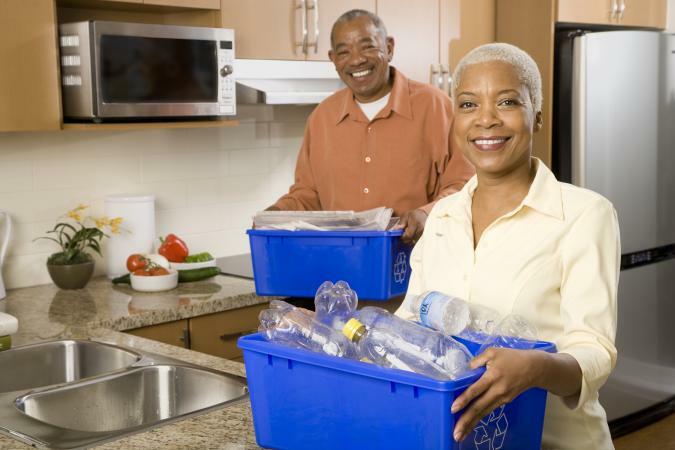 Consumer interest is a great way to get recycling programs started in communities.